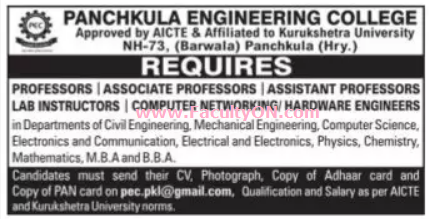 Panchkula Engineering College, Panchkula has advertised in the TRIBUNE newspaper for recruitment of Professor / Associate Professor / Assistant Professor Plus Non-Faculty jobs vacancies. Interested and eligible job aspirants are requested to apply immediately from 08th August 2018. Check out further more details below. About College: Panchkula Engineering College, is an endeavour of the Balaji Technical Education Society. The non-profitable society aims at transforming the way technical education is imparted in the country. Panchkula Engineering College aims to be a centre of excellence in the field of technical education and to shell out highly qualified, capable engineers and thought leaders, who shall be the pride of the nation. As per AICTE / KU norms. How to apply: Interested and eligible candidates are requested to send applications along with Resume, copies of certificates, Pan card and Aadhaar card to the following email address.